OTech: Digital Pathology: the next frontier for digital imaging; top ten things you should know about. 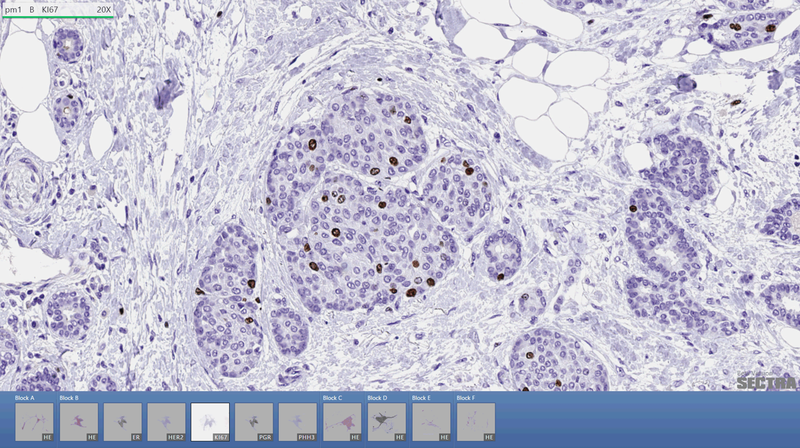 Digital Pathology: the next frontier for digital imaging; top ten things you should know about. As the first digital pathology system finally has passed FDA muster and is ready to be sold and used in the USA, it is time for healthcare institutions to prepare for this new application. Before jumping head first into this new technology, it is prudent to familiarize yourself with the challenges of this application and learn from others who, notably in Europe, have been doing this for 5+ years. Here is a list of the top ten things you should be aware of. 1. The business case for digital pathology is not obvious. 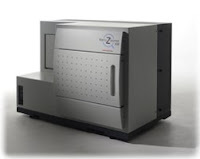 Unlike the experience in radiology where film was replaced by digital detectors, and we could argue that the elimination of film, processors, file rooms and personnel would at least pay for some of the investment in digital radiology, digital pathology does not hold promise for the same amount of savings. Lab technicians will still need to prepare the slides, and as a matter of fact, there is additional equipment needed to digitize the slides to be viewed electronically. The good news is that pathology contributes very little to the overall cost of healthcare (0.2%), and therefore, even though the investment in scanners, viewers, and archiving storage is significant, impact of this on the bottom line is small. Of course, there are lots of “soft” savings such as never losing slides, being able to conference and get second opinions without having to send slides around, much less preparation time for tumor boards, much faster turnaround through tele pathology, and the potential for Computer Aided Diagnosis. So, going digital makes every sense in the world, but it might just be a little bit hard to convince your CFO. 2. Most institutions are “kind of” ready to take the jump from an architecture perspective. Many hospitals are strategizing how to capture all of their pathology imaging, in addition to radiology and cardiology, in a central enterprise archiving system (aka Vendor Neutral Archive). And they might have already made small steps towards that by incorporating some of the other “ologies.” However, pathology is definitely going to be challenging, as the files sizes for images are huge. A sub-sampled compressed digital slide could easily top 1.5GB, therefore you should be ready to multiply your digital storage requirements by a factor of 10. As a case in point the University of Utrecht, which has been doing this for 7 years is approaching 1 Petabyte of storage. So, even if you have an enterprise image management, archive and exchange platform in place, it definitely will need an adjustment. 3. Pathology viewers are different from other “ologies.” Pathologists look at specimens in a three dimensional plane, unlike radiologists who, in many cases look at a 2-D plane (e.g. when looking at a chest radiograph). One could argue that looking at a set of CT or MRI slices is “kind of 3-D” but it is still different than when having to simulate looking at a slide under a microscope. The pathologist requires a 3-D mouse to view the images, which are readily available. The requirements for the monitors are different from other imaging specialties as well; a large-size good quality color monitor will suffice for displaying the images, which is actually much less expensive (by a factor of 10) than the medical grade monitors needed for radiology. 4. Standard image formats are still in their infancy. This is something to be very aware of; most pathology management systems are closed systems, with an archive, viewer and workflow manager from the same vendor, with little incentive to use the existing DICOM pathology standard for encoding the medical images. Dealing with proprietary formats does not only lock you in to the same vendor, possibly making migration of the data to another vendor costly and lengthy, but also jeopardizes the whole idea of a single enterprise imaging archiving, management and exchange platform. Hopefully, user pressure will change this so that the vendors will begin to embrace the well-defined standards that the DICOM and IHE community has been working on for several years. 5. Digital pathology will accelerate the access to specialists. I remember from several years back, visiting a remote area in Alaska, when it switched to digital radiology and when all the images were sent to Anchorage to be diagnosed. Prior to that, a radiologist would fly in for 2 days a week, weather permitting, to read the images. So if you needed a diagnosis over the weekend, you were out of luck. The same scenario applies for having a pathologist at those locations, as of now, the samples are sent, weather permitting, to a central location to be read. In some locations there is a surplus of pathologists, in some there is a shortage or even lack of these medical professionals. Digital pathology will level the playing field from a patient access perspective. Without having to physically ship the slides and/or specimens, it will significantly decrease the report turnaround time and impact patient care positively. 6. Digital pathology is the next frontier. Here is some more good news. Vendors are spending 100’s of millions of dollars in developing this new technology. Digital scanners that can load stacks of slides and scan them while matching them with the correct patient using barcodes are available. Workflow management software has improved. Last but not least, automatic detection and counting instead of doing this manually, of certain structures in the images is a big improvement towards characterizing patterns and therefore diagnosis can be made more accurately. 7. Don’t expect to become 100% digital. Some applications still require a microscope. The experience at the Utrecht Medical Center in the Netherlands is that you may achieve 95% conversion to digital but there are still some outliers that require a microscope because of the nature of the specimen. However, this is very manageable and only a relatively small subset. 8. 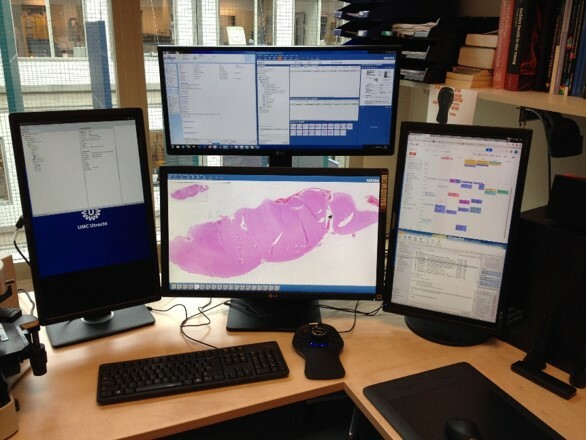 Digital pathology has ergonomic advantages. Imagine having to bend over most of the day while looking through a microscope, you can imagine that doing that day-in-day-out for many years can cause strain on your neck and back. Instead, sitting in a comfortable chair, or having a stand-up desk definitely is better, even although one needs to be careful with picking the right mouse to avoid carpal tunnel syndrome. 9. Viewing capabilities are an order of magnitude better. This is obvious for professionals who are reading medical images as a radiologist or cardiologist, but for pathologists who were bound to a single view through a microscope, and who now are having multiple images next to each other, and being able to annotate them electronically, it is a completely new world. 10. Research and education gets a major boost. 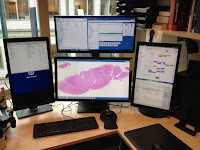 Imagine the difference when teaching a group of pathology students who are supposed to be looking at a similar tissue through their own microscope and now they all can access the same image on their computer monitor. One can build a database of teaching files and easily share them electronically. All of this seems obvious for anyone who is involved with medical imaging in other specialties, but for pathology this is a major step. In conclusion, digital pathology is finally here in the USA. However, there are some hurdles, starting with convincing the people who hold the purse that it is a good investment, then adjusting the architecture and workflows to facilitate the huge image sizes, and making sure that these systems support open standards so you are not going to be locked into a specific vendor. There are definitely major advantages and it might be expected that the benefits will soon become so evident that it will only be a matter of time before everyone will jump on the digital pathology band wagon. It is strongly recommended that you learn from others, notably in Europe who have been implementing this technology already for several years. Note: Illustrations courtesy of Prof. Paul van Diest, UMC Utrecht. Wow! So many innovations are about to come. But the mood of them is negative. I have to do an assignmet in computer science based on digital imaging. Firstly, I wanted to to look for homework assignments for sale, but now I'm too interested in my topic to do such.